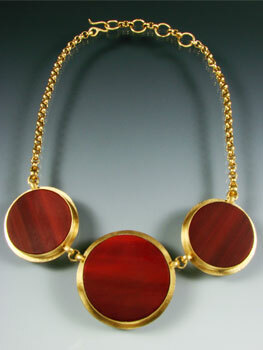 Three large discs of opaque fire red glass are set into this 18k yellow gold vermeil necklace design. The discs measure 1 5/8' for the center piece and 1 1/4" on each side. Streaks of both blue and orange red and it's matte finish make this color very appealing. The glass is hand cut and ground on diamond wheels and then the bezel set in recycled matte fine and sterling silver before being plated in 18k gold. The bezels have been roller printed for texture. Comes with an adjustable 16"-18' chain.